Since my dad began taking prednisone for his myasthenia gravis, neuromuscular disease, he has been hungry all the time. To satisfy his hunger between meals, he eats snacks like oranges, bananas, and yogurt. I still can't believe I got him liking yogurt but not just any yogurt. He will only eat Activia's blueberry and peach flavor. His favorite snack though is peanut or almond butter on rye bread with a drizzle of honey and sometimes banana slices. Sounds familiar to Elvis peanut butter and banana sandwich. My dad was born and raised in Memphis after all. One of the side effects with taking prednisone is that it can make you retain water. Concentrating on keeping his sodium intake low is important. I have done this by making everything from scratch. Store bought nut butters, even the natural varities, almost all contain salt. I decided that I was going to venture into making my own peanut and almond butters. My first batch of almond butter turned out surprisingly great. I simply processed sliced almonds in a food processor for several minutes and bam, you have smooth almond butter. The one thing I wanted to change was to roast the nuts in the oven for a few minutes to add a depth of flavor. For my peanut-almond butter, I began with peanuts that I retrieved from their shell and removed their skin. Next time, I skip this process and buy raw skinned peanuts. It took me forever to crack the peanuts and then remove the skin. Place both nuts on a baking sheet and roast for 8 minutes. Transfer nuts to a food processor. Process for 2 minutes and then scrape down the sides of the food processor. The nuts will become a powder at this point. Every few minutes, scrape down the sides of the food processor until the powder forms a paste. At this point the nut mixture has been processed for 12 minutes. After about 15 minutes, the peanut-almond butter is smooth. Store in a glass jar. Since my dad drizzles honey over his peanut-almond butter on toast, I don't add any sweetness to the nut butter but you can add honey. The empowerment of knowing that I can make something from scratch like this is so rewarding. If a first time nut butter maker like myself can do it, then you can too! This is also a perfect crafty kitchen project that would be great for kids to do. Biscuit Heaven...I have just entered that hallowed ground established by my ancestors before me!! I have achieved that light and fluffy texture that my great-grandmother's biscuits were famous for.....and I used olive oil!! From the time that I was small, I can remember walking into my great-grandmother's kitchen just in time to see her pulling out a large cast-iron skillet full of mountain high biscuits from the oven. They were quickly flipped out upon a plate to expose their crusty browned bottoms. Then, the plate of biscuits, big and feathery light, circled around the family table with hands grasping from all sides as her words echoed, "Don't just take one, have two..., there are plenty more!" At first bite, your teeth slid into the creaminess of melting butter slowly infiltrating the hot feathery softness and finally landed to rest upon the crunchy brown bottom.... You soon understand. It is hard to eat just one. Biscuits are the bread of life in the South, not just for breakfast or dinner, but also for dessert...as demonstrated at our family table where they are savored with a slathering of fresh fruit preserves or jelly. I learned the craft of making biscuits from my great grandmother. In her early years, she would make her biscuits in a wooden dough bowl and then transitioned into using a large vintage bowl. Her process included making a well in the always used Gold Medal self-rising flour and incorporated vegetable oil and milk. I would diligently watch her form the sticky dough into smooth balls. I was amazed at how quickly she could whip up a batch of biscuits. The biscuits were baked in her well seasoned cast-iron skillet. If her cast-iron skillet could talk, it would probably share of the hundred plus years of use by my great grandmother's mother and her and the story of how it lost its handle. The act of recreating her biscuits but putting my own twist to them was the challenge. Olive oil and I have a strong bond. I not only love the intense peppery and sometimes fruity flavor of extra virgin olive oil but also its health properties. I wanted to incorporate it into a biscuit dough. Preheat oven to 425 degrees F. Grease a 9-inch cast-iron skillet with 3 Tbsp. olive oil. After sifting the 2 cups of the flour into a medium mixing bowl, make a well in the center of the flour. Pour the olive oil in the well and then add a few tablespoons of the milk. Using one hand, carefully stir the liquid mixture while incorporating more flour and gradually adding more milk. Once a wet dough forms, begin using a folding technique to incorporate the rest of the flour and milk, if the dough is too wet add 1 to 2 tablespoons more flour. The dough will have a wet sticky consistency. Be careful not to overwork the dough. Working with floured hands, pinch off a handful of dough and quickly roll into a ball in the palm of your hands. Tuck any rough edges into the topside of the ball. Carefully place the smooth side of the ball into the skillet to coat with oil and flip over. Repeat the process with 5 additional dough balls. The dough balls will be touching each other in the skillet. Bake on 425 degrees F for about 12 minutes or until biscuits have fully risen. Do not overcook. If tops are still white, change your oven setting to broil and cook until the tops are golden brown. My mom and I have been preparing more "from scratch" meals for our family. We did a lot of cooking from scratch before but even more now because my dad was prescribed prednisone, a steroid. My dad has a neuromuscular disease, Myasthenia Gravis. He had a MG crisis because of a reaction to a new medication he was taking which put him into the hospital. After being treated with IVIG for several days in the hospital, he was released. His neurologist switched his medication of Mestinon and prescribed him a low dose of prednisone. The worries that my mom and I have always had about the one day he might have to take prednisone were the side effects. Diabetes, osteoporosis, and increased appetite are some of the effects. This steroid can also make a person retain water resulting in gaining weight uncontrollably. My mom and I are very concerned with all of the side effects. We want to do whatever we can to help combat these effects. This is where the "from scratch" cooking began. We knew that sodium would be a big concern so we decided to try and use as little salt in our cooking as possible. This also meant a change in the canned, prepackaged, etc. products we use. You might think that it wouldn't be hard to flavor foods without salt but it is. So, I put my creativity to use. Tasting herbs and spices and determining what pairs well with them has challenged me. If you watched me compete on "Masterchef," then you know I like a challenge. Tasting a vegetable organically without seasoning it and determining whether it has a natural sweetness, bitterness, etc. is an important step. Sweet potatoes have a natural sweetness and when baked versus microwaved, the sweetness is enhanced. Rutabagas like sweet potatoes have a natural sweetness. I like to cube them, toss in walnut oil, and roast in the oven with sage, and walnuts. Spices that would pair well with the rutabagas or sweet potatoes are cinnamon and cardamom. There is black and green cardamom. Green cardamom is traditionally used in Indian baking for sweets. Black cardamom imparts a smoky flavor and is used in garam masala for curries. I sliced some fingerling potatoes and roasted them off in the oven with olive oil, pepper, garlic, and rosemary. The product was crispy oven-baked fingerling potato fries. The next step would be to reach in the refrigerator for ketchup but not when you read the sodium content per serving. My mom pulled out a 8 oz. can NO SALT ADDED tomato sauce and decided she would quickly prepare some homemade ketchup. Adding sweetness with about 1/4 cup natural, no sugar added apple juice and 1 Tbsp. sweetened dried cranberries (there are naturally sweetened dried cranberries like pomegranate which is what we used) in with the tomato sauce in a small saucepan. Cook the mixture over medium heat for 10 minutes, stirring occasionally. Then process the mixture and the result is a naturally sweetened ketchup. If you like a little more sweetness, add honey. 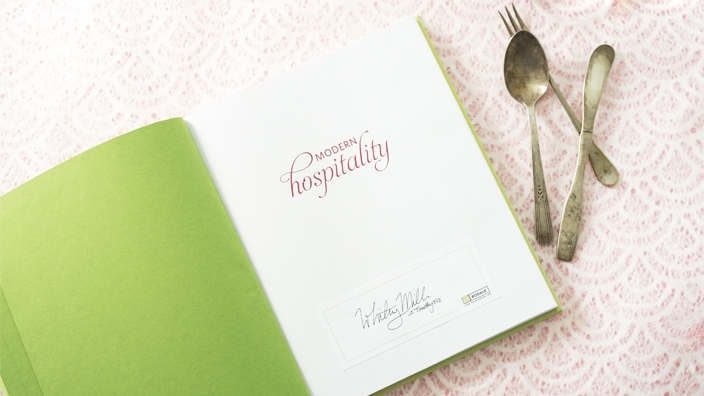 In my cookbook, Modern Hospitality, I designed an essentials section. It features everything from a homemade buttermilk herb dressing "ranch," blackened seasoning rub, miracle marinade, olive salad, pimiento cheese, turnip green pesto, and sun-dried tomato and cranberry ketchup. The miracle marinade is perfect for flavoring anything from meatloaf, steaks, hamburger patties, and more. The olive salad is a quintessential ingredient in a muffuletta, traditional New Orleans sandwich, and can be tossed with pasta for a quick pasta salad. The pesto is a great on its own with olive oil and focaccia bread for dipping. It can also be used as a spread for sandwiches like paninis. Cooking from scratch gives me a sense of empowerment. The first time I made homemade ketchup was actually by accident but when the result produced a smooth texture and sweetness like ketchup, it was exciting.